This was our attempt to fly a kite in East River Park. The wind was coming and going, so the kite tended to nose dive after a couple of minutes. A Parks person told us (not unreasonably) to not fly our kamikaze kite on the track where people were running, and as we were leaving someone volunteered (at length) that what we needed was a longer tail. 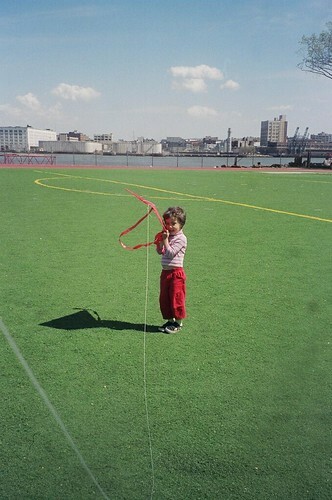 After he finished, Eden said to me, "I don't want anyone else to talk about our kite."